Just finished looking over data. To be honest, it is starting to look bad for parts of Illinois and Indiana. I'm not seeing any new information that says the threat for severe weather is diminishing. Let me show you what this morning's run (12z) of the high resolution RPM computer model is projection. What you will see is the model's projection of what the radar will look like through the day. Please keep in mind, this is not reality, it is just a computer model projecting what could happen. Here is a look at 1pm ET. Note that the model is starting to fire up a line of thunderstorms over northwest Illinois. Also note the individual discrete cells flaring up over central Indiana. 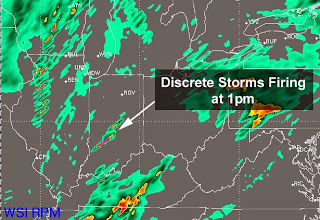 The discrete cells are very concerning during the early afternoon. If a few discrete storms can get going, they very well could become supercellular and tornado producers. Here is a look at 2pm ET. The individual storms are moving northeast across Indiana. Also, a line of storms is starting to become more organized from southern Wisconsin to St. Louis. Further south, storms are beginning to develop over southeast Missouri. 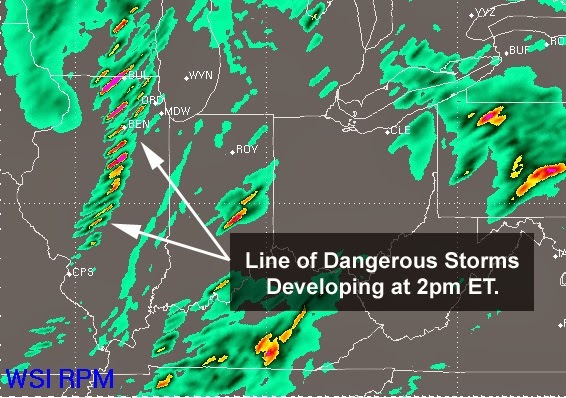 What is concerning about this image is the indication of storms beginning to move in to the Chicago metro area. At that same time, the Chicago Bears game will be in the middle of the second half. Not good to have tens of thousands of fans in the stands with possible severe storms moving in. Next is a look at 4pm ET. The line is becoming better organized as it races to the east. 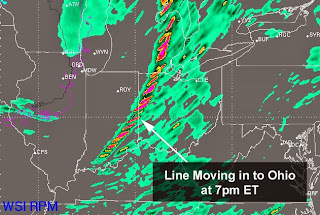 While there is a line, it is interesting to note that the RPM is trying to suggest we are still looking at more of individual cells along a line instead of all the storms congealing in to one line. This is not a good thing. This indicates to me that the potential for tornado development is still very high. 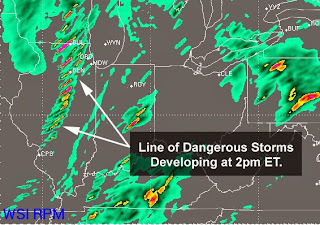 Several strong tornadoes would be possible along this line of storms. Here is a look at 5pm ET. 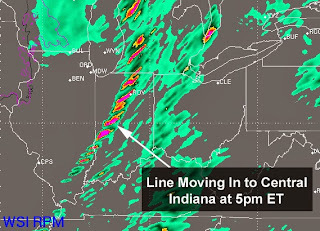 Strong to severe storms are now beginning to move in to Central Indiana. At this point, forecast data suggests storms will be moving east-northeast at 65mph. These storms will still have the potential to produce strong tornadoes. Storms are also starting to get stronger towards southern Illinois. Here is a look at 7pm ET. 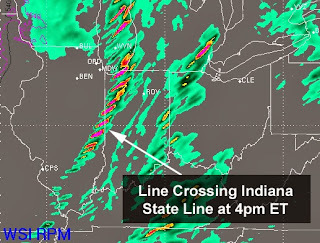 The line is now crossing the Indiana/Ohio border and storms are still racing east-northeast at 65mph. 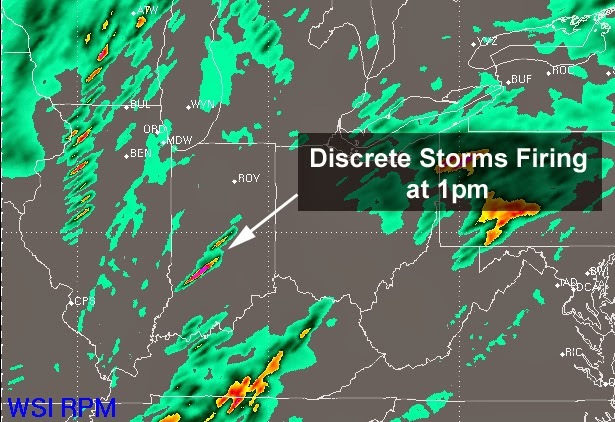 The model also suggests the storms are moving through Columbus, Indiana and approaching the Louisville metro area at this time. Moisture is streaming north on southerly winds. As of 10am ET, dew points were already in the 60°s in Illinois as far north as Chicago. In Indianapolis the dew point was 59°. By the afternoon the dew points should be well in to the 60°s for Indiana. The moisture will act as gasoline for the storms to thrive off. Unfortunately, it does look like a tornado outbreak is likely over Illinois and Indiana. Hopefully not, but there are too many signs pointing to it today. Along with tornadoes, damaging winds will be a HUGE threat from thunderstorms.